In this review, we’ll cover the newest atomizer from Wotofo and Mrjustright1. The new Wotofo Profile RDA is aimed at providing the best vape experience from mesh coils while implementing some unique features to give great flavor and smooth airflow. Does it deliver? We’ll let you know in our Wotofo Profile RDA Review! 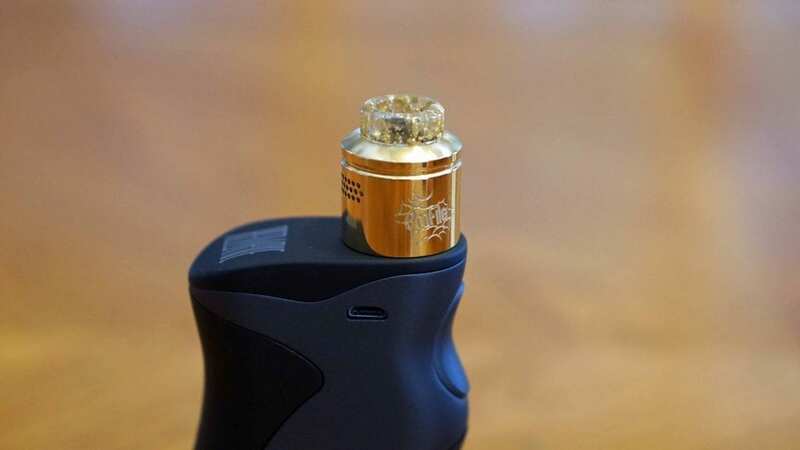 We’ll give you our first impressions, go over building and wicking, performance, pros and cons and conclude with whether or not we recommend the Wotofo Profile RDA! Click Here To Check Out the Wotofo x Mrjustright1 Profile RDA! Wotofo has a new style of packaging now, and it’s been seen in a few of their atomizers and devices this year. Their packaging has always been really good and the same can be said for this one as well. On the front you’ll see the design or graphics of the Profile RDA, and on the back you’ll see information about what’s included, where it’s made alongside a warning. The color I received is Golden, but there’s a lot more colors available such as Stainless Steel, Black, Blue, Gunmetal and Rainbow. Usually I’m not the biggest fan of Gold colored RDAs, but this one is quite nice. Once you slide open the package, you’ll see the top cap, deck and extra clear drip tip. The drip tip that’s installed is more of a see-through clear and has gold flakes. Underneath all of this is where you’ll find your extras such as cotton, spare o-rings and screws, screwdriver, allen key, mesh tool, a pre-built exotic coil and mesh strips. You do get a lot with this RDA, which is always a good thing! My first impression of the actual RDA was that I did like the overall look and design. It’s slightly on the shorter side, and the machining was very good. It does have the “Profile” logo or design on one side of the atomizer, so it’s a pretty clean looking device. I do want to mention that there was no machine oil whatsoever, which is always a pro in our book! However, like with all other atomizers, we always recommend to wash it thoroughly before vaping. All in all, my first impressions of the Wotofo x Mrjustright1 Profile RDA was great! I liked the overall look and design, so I was definitely excited to give this RDA a vape! 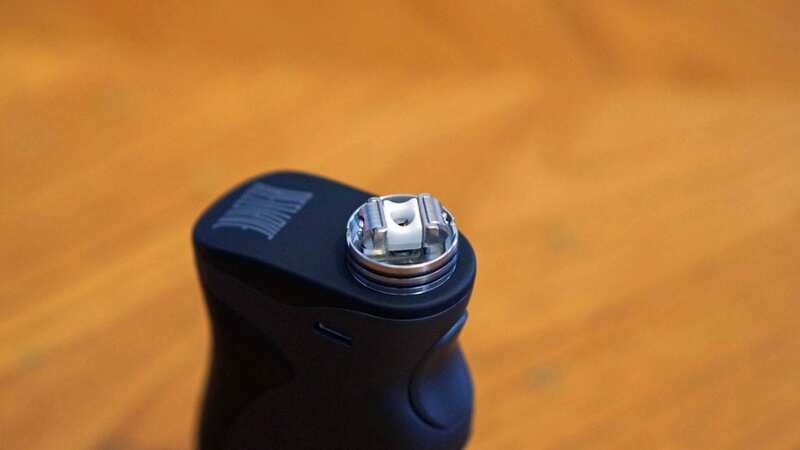 The Wotofo Profile RDA features a clamp style build deck, but the clamps are located on the side. Like mentioned previously, it’s design was to be able to accommodate mesh coils, but you can throw a single coil build in here if you desire. With this clamp style deck, it makes it an absolute breeze to install either a mesh coil or regular single coil. Now, when you’re installing a mesh coil, I do recommend utilizing the mesh tool that’s included. Simply use the thicker side of the tool to form the mesh coil to exactly fit in the Profile RDA by Wotofo. Once you do this, it basically folds the included mesh coil into the exact way you want it to fit inside of the atomizer. Without this tool, it may require a bit more effort, but thankfully they’ve included this tool, which is honestly a brilliant idea. What’s even better is the spring loaded ceramic support block under where your coil sits. This ensures that cotton will always push up into the mesh, so cotton is always making contact. This is a key feature to this RDA, as an issue is always with cotton breaking down and not making complete contact with your mesh coil or simply not having enough cotton; therefore giving you a really bad dry hit. With this support system in place, it completely eliminates this potential issue, which is probably the biggest pro to the Wotofo Profile RDA. In addition, the cotton they provide has that shoelace at the end, which makes it even easier to wick. They did send along a pack of it, but only 1 piece is included in the package. I do wish they included at least 2 or 3 inside of the actual package of the RDA. Wicking a standard coil is easy as well, simply cut your cotton where you know the cotton will touch the bottom of the juice well. You can fit quite a lot of cotton in here, but make sure you don’t put too much cotton, especially when squonking. Also, be sure to sit the coil just a bit higher as you want to avoid the coil touching the ceramic. Overall, building and wicking the Profile RDA is easy, especially with the included mesh tool. Even with a standard exotic coil such as a Fused Clapton or Alien, it was effortless! Now onto the biggest question of any review, how does it perform? Well, I’ll start with the included mesh coil. Honestly, this atomizer changed the way I view mesh coils in an RDA. I wasn’t really a fan before, because of the potential issues mentioned above and getting a dry hit. Once you’ve experience a dry hit with a mesh coil build, you’ll almost never want to vape it again, it’s really that bad. However, with it’s support system, I never once had that issue happen to me. The flavor you get from the included Mesh Coil is very clean tasting and just good overall. 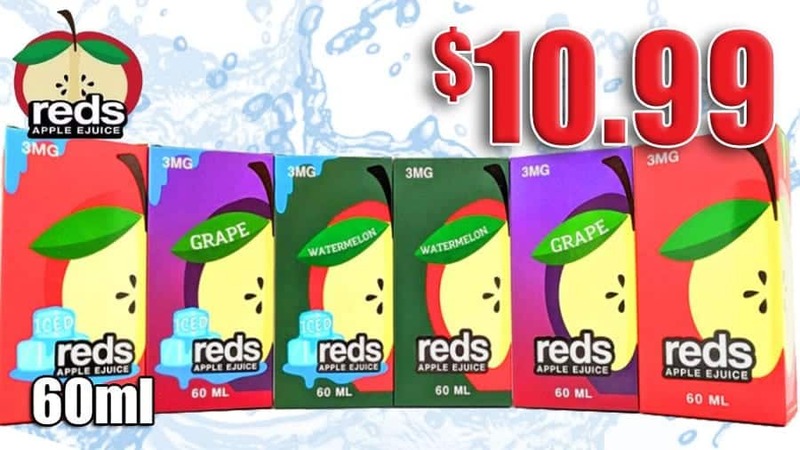 The flavor from mesh is just a bit different than what you’d get with other regular coils we use in vaping today. I would typically vape it between 55w and 65w, which is the recommended max. I would not go much above 65w, as you’d risk losing some flavor and potentially getting a dry hit, especially if the coil and cotton is not fully saturated with e-liquid. The airflow is silky smooth as well with it’s honeycomb design. You can easily adjust it by simply turning the top cap and no matter what airflow setting I was at, it was incredibly smooth and very quiet. You can have it fully wide open, close off just the top row and then start closing off the bottom two rows. I preferred the top airflow holes fully closed as I do prefer somewhat of a restricted direct lung vape, and it did increase the flavor just a little alongside giving me a slightly warmer vape experience. With a standard exotic coil, I installed a simple Fused Clapton which had a resistance of 0.39 ohm. The flavor was also very good, but I did prefer the mesh coil in this one. It just vapes that good with a mesh coil installed, and it was to be expected, but that’s not saying it didn’t vape well with a standard coil! Something I do want to mention is that when squonking, e-liquid comes up right in the middle and side, which is perfect for a mesh coil. That further ensures that your cotton and coil will be fully saturated from all angles. Another great design move, and just makes the vape experience that much better. Lastly, there is notches on the deck itself which aligns with the top cap, so your airflow is always in the correct position and makes it so that when adjusting airflow, your entire top cap doesn’t move. All in all, the Wotofo Profile RDA exceeded my expectations when it came to performance, especially with a mesh coil. The flavor is fantastic, and the airflow is silky smooth and it’s one of the quietest RDAs I’ve ever vaped on. In conclusion, the Profile RDA by Wotofo and Mrjustright1 is an excellent performing RDA whether you install a mesh coil or standard coil. The overall design is simply amazing, and really did change my perspective when it comes to vaping with mesh wire in an RDA. Not to mention, the build quality is top notch, and the flavor I get is great. It was difficult to really find cons with this one. I do think they should have included more than 1 piece of cotton, because they do include two mesh coils in the packaging. Thankfully they do sell that cotton separately if that’s something you’re interested in. The next is that you can’t really do a dual coil build in here, but that’s to be expected since you know what you’re getting into. There’s two things that was absolutely genius with this atomizer, the first is the support system which pushes cotton into the mesh coil and the second is that tool which makes it where you can fit your mesh coil perfectly in the Profile RDA each and every time. 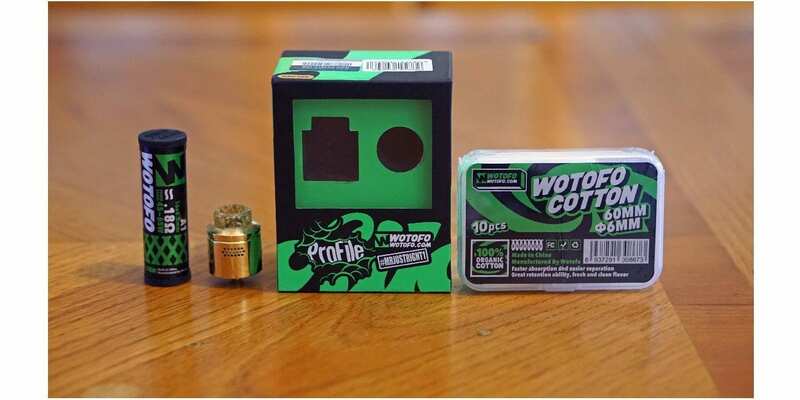 If you enjoy vaping on mesh coils, or simply interested in the idea about it, but looking for an atomizer where it’ll actually perform very well without the scare of getting a bad dry hit, then the Wotofo Profile RDA is definitely one that’s recommended to check out. It’s probably the best mesh RDA on the market today. We hope you find this review helpful in finding the right RDA to fit all of your vaping needs! Feel free to leave any questions or comments down below! 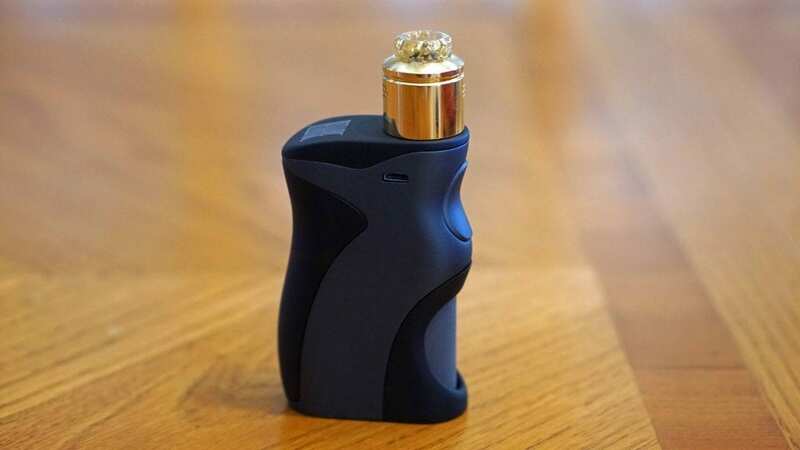 Thanks for reading our Wotofo Profile RDA review!